Tokyo – Prostate cancer is one of the most common cancers in men worldwide. In nearly three out of four patients the cancer causes metastasis, leaving the original site of the tumor and spreading to distant sites in the body. Metastatic prostate cancer cells often travel to bone, where they can affect bone structure and cause severe pain, pathological fractures, and spinal cord compression. A better understanding of the process that enables these cancer cells to remodel bone may aid in the search for new therapies. 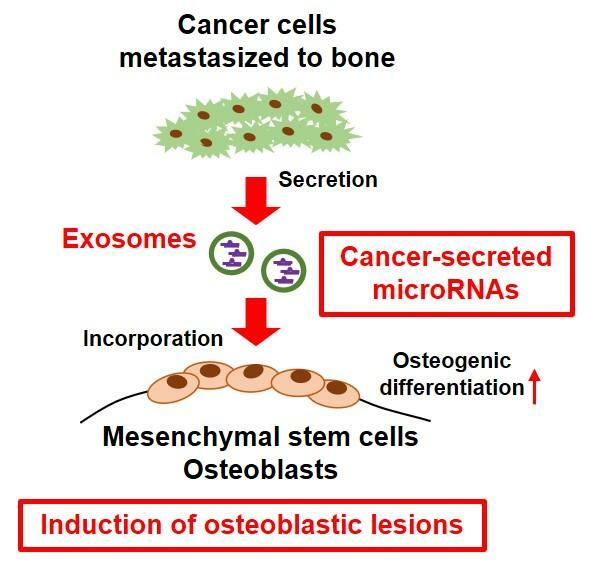 In a study published in Proceedings of the National Academy of Sciences, researchers at Tokyo Medical and Dental University (TMDU) report the discovery of an RNA molecule that may play a key role in bone restructuring caused by prostate cancer (Fig.1). To accomplish this, the researchers looked for differences between bone-forming prostate cancer cells and bone-resorbing breast cancer cells. They focused on microRNAs–short RNA molecules that regulate the expression of a variety of genes. Recent studies have shown that microRNAs are delivered from cells to cells via exosomes to serve as intercellular communication tools. MicroRNAs secreted by cancer cells can alter the expression of genes in non-cancerous cells, disrupting their normal function and promoting tumor growth. Strikingly, when miR-940 was expressed in bone-resorbing breast cancer cells, the cells triggered bone-forming lesions in mice–behaving as though they were prostate cancer cells (Fig.2). Their findings suggest that miR-940 plays a central role in the bone-forming ability of prostate cancer.